Stems: Erect, slender, 1 to several, much-branched, soft-hairy above, nearly glabrous below. Leaves: Opposite, numerous, simple, short-stalked to sessile, narrowly lanceolate, 2 to 5 inches long, 1/2 to 1 inch wide, gray-green, densely soft-hairy, glandular-dotted, 3-veined beneath; margins toothed, particularly above middle; tips sharply pointed. Inflorescences: Panicle-like clusters, broad, many-flowered, terminal. Flowers: Heads cylindric, about 1/4 inch tall; bracts lanceolate, overlapping, tips rounded or blunt; ray florets absent; disk florets 5, corollas white. Fruits: Achenes, small, angled, blackish, tipped with whitish bristles, enclosing small seed. Habitat: Dry, open areas, old fields, open woodlands, thickets, roadsides, and disturbed sites. Comments: According to New England tradition, Joe Pye was a Native American who treated spotted fever with species of Eupatorium. Large stands of tall joe-pye weed often indicate overgrazing. 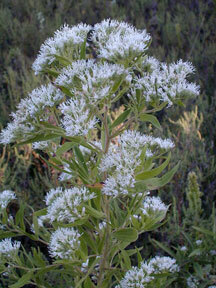 It is the most frequently encountered Eupatorium in Kansas. Tall bonset has opposite leaves while false boneset Brickellia eupatorioides has alternate leaves. They are occasionally mistaken for one another.